Equip your kitchen with a multi-tasking gadget to make life easier. 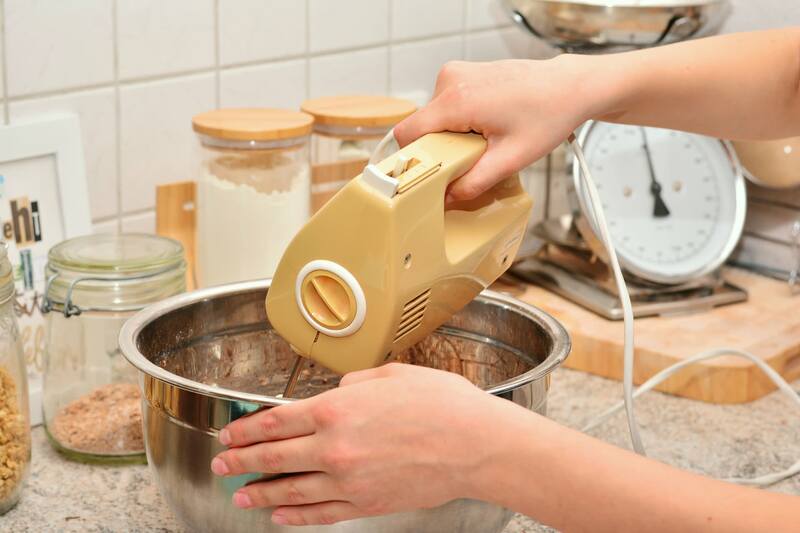 With a hand mixer at your disposal, you can simply dodge the hassle of bulky machines. Hand mixers are equally as competent as stand mixers and flexible to manoeuvre, so save up on space and select the mixer for your needs right here. Are you on the lookout for a durable mixer to help you with your baking? This portable Scarlett hand mixer has a powerful motor with 7 different speed setting to help you with all kinds of baking needs. Kneading continuously could prove to be strenuous. But with this hand mixer, you can gently ease into the process while gradually increasing the speed. Here’s a quality hand mixer at a budget price. This is an international no-frills branded hand mixer that would fit right in your kitchen to assist you. With low power consumption and a speed booster, minimise your time mixing in the kitchen. The mixer is great as a solid companion for new users and makes a perfect housewarming gift for a baking enthusiast. A one-tool for all your needs, this hand blender and mixer combination effortlessly blends, chops, purees, mixes and whisks ingredients like a seasoned chef. With subtle control, the hand mixer is easy to clean and maintain. You no longer need to depend on individual kitchen gadgets, not when this smart combo saves your energy and time. And, it’s certainly safe to pop into the dishwasher too. Love baking and cooking but hate the after-cleaning? Throw away those worries with this upgraded hand mixer. Churning and blending are done efficiently with lesser splatter all over the surface as its high-power capacity helps you to whip up mixtures and batters, all with a cool control. Easy-to-use, just hover the mixer over the ingredients and work on the mixture competently. Simply avoid any mess and have a quick clean up soon afterwards. A trustworthy hand mixer, Kyowa is a lightweight choice that offers you a soft and comfortable grip to mix away according to your needs. The stainless-steel beater and mixer feature 5 various speed control for different mixing functions. Now one can conveniently work on their baking or cooking with minimum effort but maximum comfort. Indeed, a high-performing hand mixer for long-lasting use. Durable and ergonomic, this hand mixer works wonders for heavy users. The thumb tip control helps you to keep the speed in check while whisking various ingredients into the batter. With an open-end control, one can also manoeuvre easily without much struggle. Its design specifically heightens comfort while avoiding letting the mixer weigh users down when in continuous use. This Keimav Hand Mixer is a simple and practical hand mixer, especially for users interested in baking cakes and bread. This is thanks to the sturdy beater attachment, which is ideal for mixtures of various consistency. Utilising a flexible speed control, users can easily shift speed with a single touch. Once can also manage folding and beating gently easily without overworking the batter. The strong dough hook makes mixing and kneading easy, especially for a beginner baker. For completion, the hand mixer comes with a complimentary electronic kitchen scale to aid in the weighing and measuring.